Russia and the European Union have called for a peaceful approach to solving the Ukrainian political crisis. Russia's Vladimir Putin and EU leaders agreed that objections to the outcome should be examined by the courts. But they remained split on whether the thought the vote was fair. The EU has pointed to claims of election abuses. Before the talks, Mr Putin sent a message of support to Ukraine's Prime Minister Viktor Yanukovych - who election officials named as the winner. The EU, and the US, have voiced dismay over a result widely believed to have been falsified and rejected by opposition candidate Viktor Yushchenko, whose supporters have been holding mass rallies in protest. The new European Commission chief Jose Manuel Barroso urged a "serious, objective" review of the election result and warned of "consequences" for ties with Ukraine otherwise. In the news conference after the summit, Mr Putin said no-one had the "moral right to push a big European state to any kind of massive disorder". "All questions connected with the election situation in Ukraine must be resolved solely within the framework of the existing constitution, in accordance with the law," he said. "All complaints must be handled through the courts." He added that he would work with any elected president of Ukraine. 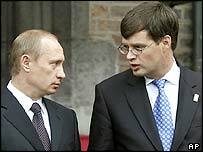 Dutch Prime Minister Jan Peter Balkenende, whose country holds the EU's rotating presidency, said: "The election did not meet the international standards. Therefore the EU is not able to accept the result." Thursday's talks were due to have taken place early in November but a wrangle over the new commission's line-up at the European Parliament caused it to be postponed. The BBC's Chris Morris said there had been limited progress on some other issues at this summit - agreements on how Russia and the EU should hold future discussions on human rights and on problems associated with the Russian enclave of Kaliningrad which is now surrounded by EU territory. Mr Putin's telegram to Mr Yanukovych ahead of the talks added to speculation that the summit would be dominated by the Ukraine crisis. The Russian president had moved swiftly to congratulate the Ukrainian government candidate on his victory in the presidential election before official results were released. On Thursday, the Kremlin said Mr Putin had sent another telegram to the winner. He said Mr Yanukovych's election would help "bring the Russian-Ukrainian strategic partnership to a new level. "Citizens of our nations, linked by common historic and cultural links, are becoming even closer to each other."